pTYB3 is an E. coli expression vector (7,477 bp) used in the IMPACT™ Kit (NEB #E6901) (1). This C-terminal fusion vector is designed for the in-frame insertion of a target gene into a polylinker upstream of an intein tag (the Sce VMA intein/chitin binding domain, 55 kDa) (1,2). This results in the fusion of the C-terminus of the target protein to the N-terminus of the intein tag. Thiol-induced self-cleavage of the intein releases the target protein from the chitin-bound intein tag, resulting in a single column purification of the target protein (3). For fusion of the N-terminus of the target protein to the intein tag, use pTYB21 (NEB #N6709) or pTYB22 (NEB #N6710). The NcoI site in the polylinker contains an ATG sequence for translation initiation. Use of the SapI site allows cloning of the target protein adjacent to the intein, resulting in cleavage of the target protein without any additional amino acids at its C-terminus. Unique sites are indicated in bold. 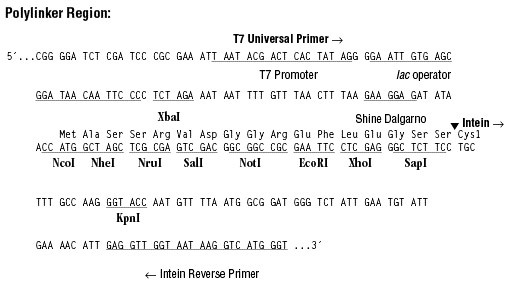 Expression of the fusion gene is under the control of an IPTG-inducible T7 promoter (4). Origin of DNA replication from bacteriophage M13, which allows for the production of single-stranded DNA by helper phage superinfection of cells bearing the plasmid (M13K07 Helper Phage, NEB #N0315). A pBR322 derivative with a ColE1 replication origin. Other IMPACT vectors are available which allow for fusion of a target gene to N- or C- terminus of an intein. The cleavage reaction may be induced by thiol reagent or temperature/pH shift. Companion vectors (pTYB1, pTYB2, pTYB4) differ only in the sites present in the polylinker. A wide range of E. coli host strains: T7 Express Competent E. coli (High Efficiency) (NEB #C2566) or BL21(DE3) Competent E. coli (NEB #C2527) and derivatives. Chong, S., Mersha, F.B., Comb, D.G., Scott, M.E., Landry, D., Vence, L.M., Perler, F.B., Benner, J., Kucera, R.B., Hirvonen, C.A., Pelletier, J.J., Paulus, H. and Xu, M.-Q. (1997). Single-column purification of free recombinant proteins using a self-cleavableaffinity tag derived from a protein splicing element. Gene. 192, 271-281. Watanabe, T., Ito, Y., Yamada, T., Hashimoto, M., Sekine, S. and Tanaka, H. (1994). The role of the C-terminal domain and type III domains of chitinase A1 from Bacillus circulans WL-12 in chitin degradation. J. Bacteriol. 176, 4465-4472. Chong, S., Shao, Y., Paulus, H., Benner, J., Perler F.B. and Xu, M.-Q. (1996). Protein splicing involving the Saccharomyces, cerevisiae VMA intein: the steps in the splicing pathway, side reactions leading to protein cleavage, and establishment of an in vitro splicing system. J. Biol. Chem. 271, 22159-22168. Dubendorff, J.W. and Studier, F.W. (1991). Controlling basal expression in an inducible T7 expression system by blocking the target T7 promoter with lac repressor. J. Mol. Biol. 219, 45-59.